posted by Howard B. Owens in GGLDC, GCEDC, news, business. The Genesee Gateway Local Development Corporation (GGLDC) approved a revised and consolidated loan and two purchase and sale agreements for parcels in the Gateway II Corporate Park at the corporation’s Nov. 1st board meeting. Artisinal cheesemaker Yancey’s Fancy requested the revision and consolidation of a January 2017 loan for an expansion project at the company’s Town of Pembroke facility. A $233,449 loan from the GGLDC’s Revolving Loan Fund #2 will close out the fund in its entirety and will be consolidated with two outstanding loans totaling $340,000. The GGLDC also approved the sale of a 22.2-acre parcel of land at the Gateway II Corporate Park in the Town of Batavia to Mega Properties Inc. which plans to build a 60,000-square-foot facility. 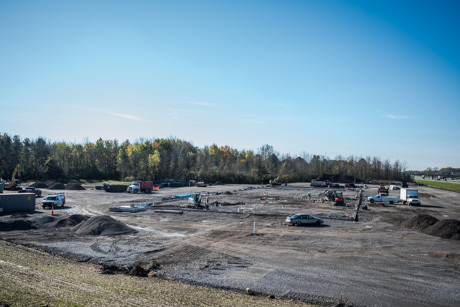 Wellsville Carpet Town Inc. received approval from the GGLDC to purchase a 2.9-acre parcel of land also located in the Gateway II Corporate Park. Wellsville Carpet Town plans to construct a 15,000- to 20,000-square-foot facility for an outlet center at the site. A purchase and sale agreement set the land price at $45,000 per acre. The company owns Ashley HomeStore, a business also located in the Gateway II Corporate Park. Both Mega Properties Inc. and Wellsville Carpet Town Inc. may seek incentives from the Genesee County Economic Development Center (GCEDC) in the future. The Board of Directors of the Genesee Gateway Local Development Corporation (GGLDC) passed a budget for fiscal year 2019 at its board meeting on Nov. 1. The budget anticipates cash outflows of approximately $2.5 million. 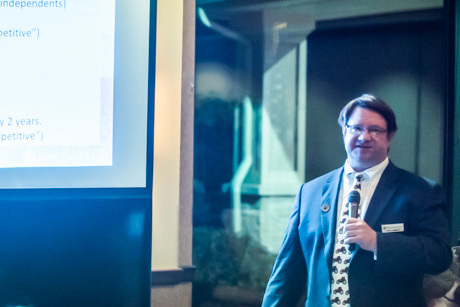 “The mission of the GGLDC is to foster local economic development by making real estate development investments that prepare sites in Genesee County for new corporate tenants,” said Tom Felton, chairman of the GGLDC. The anticipated 2019 expenditures of the GGLDC include operations and maintenance for the MedTech Centre building, site/corporate park maintenance, an economic development program support grant to the Genesee County Economic Development Center (GCEDC), continuing to support a dedicated workforce development consultant, and professional services. Other significant items include: an $890,000 pass-through grant from the New York State Department of Transportation that furthers the ability of the tenants of the Genesee Valley Agri-Business Park (Ag Park) to access rail; $655,000 in debt service payments supporting development at the Ag Park and the MedTech Center campuses; as well as $352,000 in expenses related to wastewater treatment facility upgrades in the Village of Corfu in partnership with the Town of Pembroke, supporting the Buffalo East Technology Park. A major source of revenue is rent of $670,000 from the MedTech Centre facility. In addition, $205,000 will be received through the Empire Pipeline Community Benefit Agreement for the final payment of Ag Park bonding. Additional cash receipts will include $202,000 in principal and interest payments from several companies repaying loans made in previous years. posted by Howard B. Owens in GGLDC, pembroke, business, news. The Genesee Gateway Local Development Corporation (GGLDC) will consider approving a revised and consolidated loan as well as two purchase and sale agreements for parcels in the Gateway II Corporate Park at the agency’s board meeting Thursday, Nov. 1st. Yancey’s Fancy has requested the revision and consolidation of a January 2017 loan for an expansion project at the company’s town of Pembroke facility. A $233,449 loan from the corporation’s Revolving Loan Fund #2 will close out the fund in its entirety. It would be consolidated with two outstanding GGLDC loans for a total of $340,000. 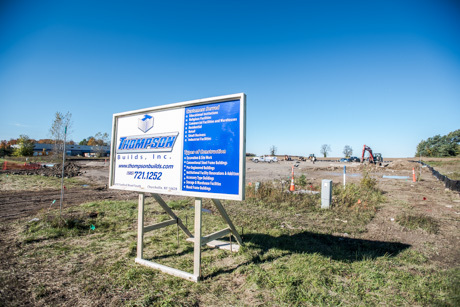 Mega Properties, Inc. is seeking to purchase a 22.2-acre parcel of land at the Gateway II Corporate Park in the town of Batavia in order to construct a 60,000-square-foot facility. The company owns Mega Properties Inc., which also is located at Gateway. Wellsville Carpet Town Inc. also is seeking to purchase a parcel of land at the Gateway II Corporate Park. Wellsville Carpet Town plans to construct a 15,000- to 20,000-square-foot facility for an outlet center at the site on approximately 2.9 acres. A purchase and sale agreement set the land price at $45,000 per acre. The company owns Ashley HomeStore, a business also located in the Gateway II Corporate Park. posted by Howard B. Owens in Ellicott Station, Gateway II, batavia, GCEDC, business. The Genesee County Economic Development Center (GCEDC) will consider approving incentives for two projects at the agency’s Nov. 1st board meeting. The Ellicott Station Project in the City of Batavia is a mixed-use brownfield redevelopment project including adaptive re-use and new construction of a blighted property in a key gateway to downtown Batavia. Savarino Companies, the project’s developer, has requested a PILOT agreement for the $22.5 million project be expanded to meet the financing needed for the project’s expanded scope and scale. A revised incentives package is valued at an estimated $3.25 million, including a property tax abatements and sales and mortgage tax exemptions. The Ellicott Station project is anticipated to create 68 full-time equivalent jobs, the construction of a 99,000-square-foot brewery, including a restaurant and beer garden, and the construction of a five-story apartment building with 55 apartments and class-A office space. Gateway GS LLC is seeking an $18,000 mortgage tax exemption for the first of five planned 27,000-square-foot spec buildings to be constructed at the Gateway II Corporate Park in the town of Batavia. The $2.6 million project, which is being done by Gallina Development Corporation, has previously received approval for property and sales tax abatements. posted by Howard B. Owens in Freightliner & Western Star of Batavia, business, batavia, news. We get a lot of questions about the construction project off of State Street next to the Thruway in Batavia. The project is a new 30,000-square-foot warehouse and service center for Freightliner & Western Star of Batavia, LLC. The company is expanding beyond its current West Seneca location. The company wanted a location close to the BOCES campus and plans to create at least 30 new jobs. The Genesee County Economic Development Center approved $437,652 in sales, mortgage and property tax exemptions for the $4.35 million project. The project also received a $465,000 state grant because of the educational component of the facility. posted by Billie Owens in business, friedman & ranzenhofer. Friedman & Ranzenhofer, PC, a law firm with offices in Batavia, announced that Justin R. Friedman has been named an associate. He will focus his practice on criminal defense and civil litigation. 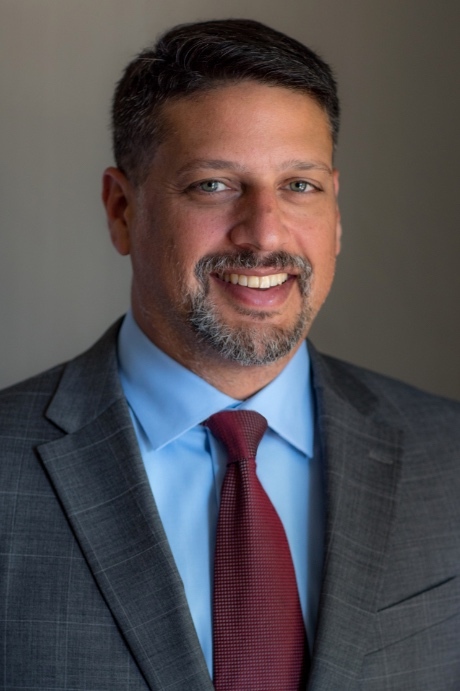 Friedman earned his Juris Doctor degree from Catholic University Columbus School of Law, M.F.A. in Creative Writing from American University and B.A. from S.U.N.Y. Geneseo. posted by Howard B. Owens in fairfield inn, batavia, news, business, Gateway II. Construction finally began just over a week ago on a new four-story, 64-room hotel on Federal Drive in the Gateway II project. The hotel will be operated by Oakfield Hospitality LLC, a company headed by Ash Patel, and branded as a Fairfield Inn. While Oakfield Hospitality acquired the property from Genesee County Economic Development Center, the project has not received any incentives from the IDA. Tom Turnbull, president of the Genesee County Chamber of Commerce, said the new hotel will help bring more visitors to Batavia. "The addition of the Fairfield Inn to Genesee County’s inventory of hotel properties adds one of the only large flagship chains – Marriott – not represented in our county," Turnbull said. "The familiarity of the Marriott name and the loyalty to its brand by its customers means even more people will be staying in Genesee County hotels. "That means not only more revenue for the hotels but also from restaurants, retail shops and other ancillary businesses in our area. More tourism revenue also means more sales tax revenue from sources outside of the county, which should help reduce the burden on county taxpayers." posted by Genesee Chamber... in River Spring Lodge, Darien, tourism, news, business. Imagine the perfect weekend getaway. It’s comfortable, secluded, and your every need is anticipated and cared for. Most importantly, it’s easy to get to. In fact, it may even be in your backyard. Welcome to River Spring Lodge, located at 1961A Church Road in Darien Center. An executive retreat and country inn, River Spring Lodge is known for providing a high-end, luxury experience to its guests. Opened in 2016, the Lodge is owned by locals Dave and Carolyn Hamer. After working in hospitality around the world for 15 years, the Hamers returned to Western New York to bring their passion for good food and great lodging to this area. Seven modern and comfortable rooms, a fully equipped conference room, and large dining room make up this beautiful country estate. Deeply influenced by French cuisine as a student at the Culinary Institute of America, Chef Dave is world-renowned and has cooked for an impressive list of A-listers and celebrities. Carolyn complements the team with touches that make the River Spring Lodge experience unique – greeting each guest with a warm welcome as they arrive and sending them off with her favorite treat, a chocolate chunk cookie, when they depart. Surrounded by the colors of autumn, the deep chill of winter snow, or the sights and sounds of spring – River Spring Lodge is a romantic escape year-round. 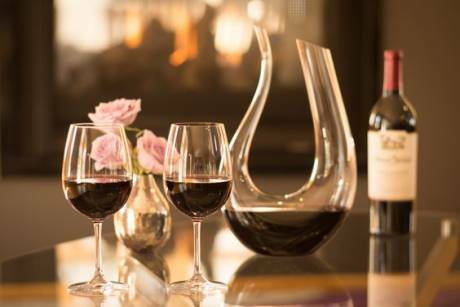 Named as one of the "top 10 most romantic inns in the country" by iLoveInns.com, they offer a couple's escape that’s sure to keep the fires burning or reignite the spark. Relax, refresh and enjoy each other’s company while your every need is tended to. The package includes a four-course dinner, three-course breakfast, and a room of unrivaled luxury. Meals are crafted by Chef Dave himself, and meant to be savored -- never rushed. When you dine at the lodge, the table is yours for the evening. Decide to retire, and you’ll find goose down duvets, European shower rooms, heated floors for the colder months, and woodland or pond-side views from your private balcony or alcove. Wi-Fi and boosted cell phone coverage allow you to stay connected with the outside world, but why would you want to? Romance isn’t the only package River Spring Lodge specializes in. The Sportsman Suite is a completely private space for hunters and fisherman, offering an exclusive steelhead fishing trip, as well as whitetail, turkey and pheasant hunts. Boasting four bedrooms and two full bathrooms along with a gun safe, poker table and darts, it’s truly a man’s world wrapped in a wilderness retreat. And man’s best friend is welcome to join the fun, as hunting dogs are allowed in the suite. All-inclusive packages are available in the warmer months. If an incredible food experience is simply what you seek, you don’t have to stay the night to get it. The dining room serves four-course dinners from 5 until 8 p.m. Tuesday through Sunday to lodge guests and local diners alike. While it’s open for reservations, we recommend you make one early. Dave and Carolyn take comfort seriously, so your table is yours for the evening, or however long you wish. Once you’re booked for the evening, start perusing the menu. Guests are requested to pre-order their meal 24 hours in advance – all part of the personalized experience – on a menu that changes regularly. Local produce is used in season, keeping fresh foods and first quality always top-of-mind. Large groups (8-18) can make reservations for the Chef’s Table, located in an adjacent room for a completely immersive dining experience – or sometimes even in the kitchen itself. 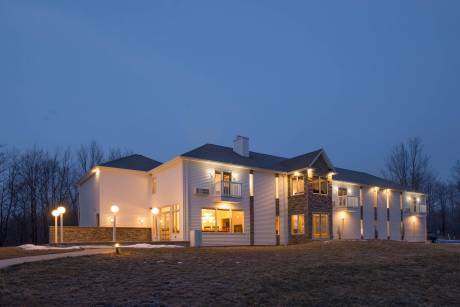 Whether you’re looking for your next hunting adventure, board retreat, romantic getaway, or just a weekend away from it all, River Spring Lodge is the ultimate in luxury and comfort. Stop by, and let Dave and Carolyn welcome you to an experience you won’t soon forget. For more information visit www.visitgeneseeny.com. posted by Howard B. Owens in Los Compadres, restaurants, batavia, news, business. 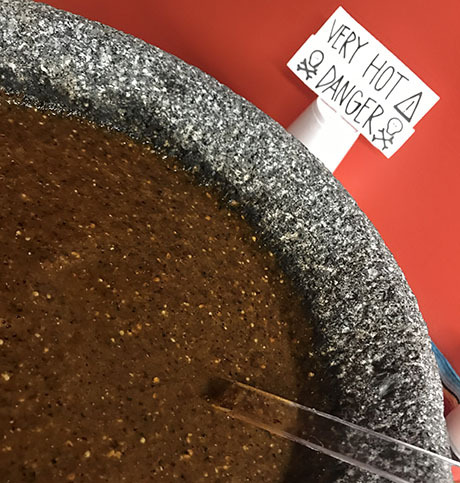 You know you're in an authentic taqueria when you spot a sign next to the salsa roja warning the gringos, "Danger!" Not every dish in a Mexican restaurant is spicy, of course, but if the discerning diner doesn't have the option to bite into something that bites back, then it's just not the real deal. A bottle of Frank's Hot Sauce on the counter doesn't cut it. 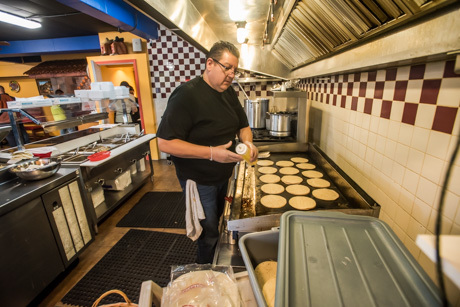 "I think we are very very authentic," said Jose Castañeda, owner of the brand new Los Compadres at 40 Oak St., Batavia. "We serve tacos and pretty much that's what we do. We will be getting a liquor license, of course, in the near future. "We do try to be as authentic as we can. We have very good people, very good cooks and they take a lot of pride in what they do. I think that helps us to be successful." 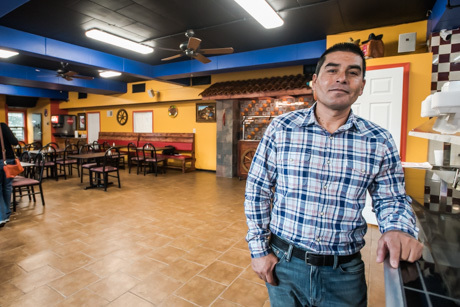 During the first week of business, local residents have had no trouble finding Los Compadres, keeping the lunch and dinner hours busy, often with repeat customers, Castañeda said. "Many people that we've served since we opened had come back three days in a row," Castañeda said. The success isn't unexpected for Castañeda. This is the 10th Upstate Mexican restaurant the Batavia-resident has opened, including another Los Compadres in Evans Mills, near Ft. Drum, with the same menu, that has done very well. "I would say that 90 percent of our customer base is military (at Los Compadres in Evans Mills)," Castañeda said. "They are very happy with the food there. We are a five-star restaurant there and we have a thousand reviews. Being that I'm a resident in Batavia and I wanted to do it here, too." For those of us with experience eating at authentic taquerias, there are other good signs when you walk into Los Compadres, starting with the straightforward menu above the front counter, the Mexican pottery and artwork displayed in the dining area, a salsa bar so you can garnish your own tacos, and the drink dispenser serving Mexican favorites, the refreshing agua frescas -- horchata, tamarindo and jamaica. On the menu, tacos, tortas, quesadillas, and tamales, with meat choices including pollo (chicken), carne asada (the main ingredient in an authentic Tijuana street taco), molida (ground beef), barbacoa (brisket), al pastor (pork with pineapple), chorizo (Mexican pork sausage), cesina (dry salted steak), lengua (tongue), camarones (shrimp), tripa (gut), taco baja (fried fish), taco compadres (fried shrimp). One of the best things about Mexican food is it is inexpensive. Tacos range in price from $2.50 to $4. Rice and refried beans on the side are only $1 each. The tacos are served with corn tortillas, which is as it should be; though, if you want to go gringo with your tacos, you can order flour tortillas. Castañeda staff takes the time with new customers who may have little experience with Mexican food to explain the difference between tacos, torts, quesadillas and tamales. The secret to a restaurant's success, Castañeda said, isn't just the food, it's the customer service. Restaurants that fail often miss the mark with customer service, so he said he makes sure his staff provides great service. Castañeda was born in Zacatecas, Mexico, which is in the north central area of the country, south of Monterrey, north of Guadalajara. His parents immigrated when he was a young child and their first jobs were picking cotton in Texas. While he was still a child, they moved to Western New York for farm work. Near the end of his 10th-grade year, Castañeda dropped out of high school and took a job on a farm in Brockport. When he was 16, he went to work for Craig Yunker at CY Farms. "I've worked ever since," Castañeda said. "I worked for the farms and any farm work I did, I did with pride in everything I did. It didn't matter what I was doing, whether I was sweeping the floor or if I was operating a tractor, I put pride in my work. That's that was how I was raised." Castañeda started in the cabbage fields at CY Farms, he said. It wasn't long before the Yunkers took notice of his worth ethic. He was made a tractor operator and then moved to pesticide management for Batavia Turf. 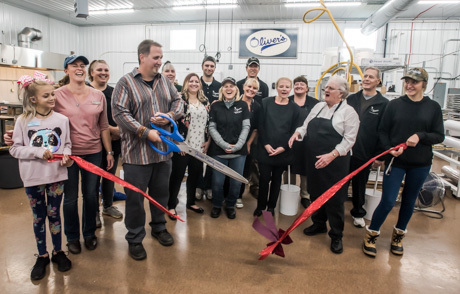 By 2006, after learning every job of the operation, he became manager of Batavia Turf, a position he held until 2016 when he quit to give his full attention to his burgeoning restaurant empire. Castañeda started in the food business after visiting a cabbage operation for CY Farms in Florida and spotting a food trailer serving migrant workers on the farm there. "I was down there and I saw people coming to the farms and bringing the food to the migrant workers so I thought it's a great idea," Castañeda said. "At that time here in Genesee County there was none of that going on, so I went to Indiana and bought a trailer." His wife, Karina, pretty much ran that business until six years ago when she became pregnant with their now 5-year-old son. In 2014, he opened his first restaurant in Lockport. He was working at this point more than 100 hours a week, starting at Batavia Turf at 4 a.m. and working until the early evening and then doing the books and paperwork for his restaurants at night. "It was busy working on the farm and trying to manage the restaurant," Castañeda said. "I felt there was a good business. It was a lot of work but it was a good business." Leaving CY Farms wasn't an easy decision, though Castañeda said it proved to be the right decision. "My wife was opposed to it because I guess, we got so used to working on the farm and making a living," Castañeda said. "I was pretty much my own boss." Castañeda and Karina have three children, Brenda, 24, Jocelyn, 17, and Jose Sebastian, 5. The family bought a home in the City of Batavia 15 years ago. "My parents were migrant workers," said Castañeda, whose mother has returned to Mexico and whose father died 12 years ago. "They started picking cotton in Texas. We grew up very poor. Even when I got married to my wife back in 1993, we were very, very poor. "I worked many hours on the farm. Still, we were barely getting by. But I think through years of hard work and persistence, I always had a dream to give my kids what I wasn't given." posted by Howard B. Owens in Mancuso Business Development Group, batavia, business, news. 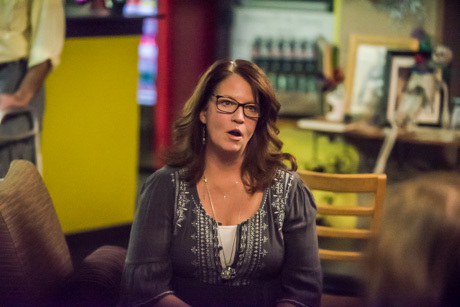 Renee Smart, owner of Moon Java Cafe on Harvester Avenue, talked during a women-in-business meeting hosted by the Mancuso Business Development Group at her coffee shop last night. 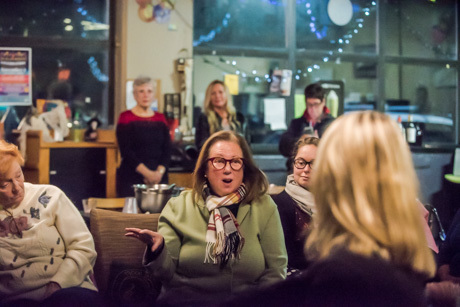 The gathering was a chance for local women business owners to meet and share their experiences and how they took their businesses from concept to reality. 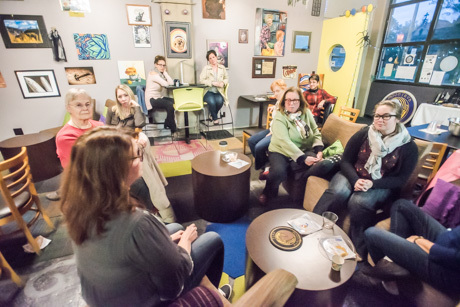 The hope is that other women might be inspired to open local businesses. 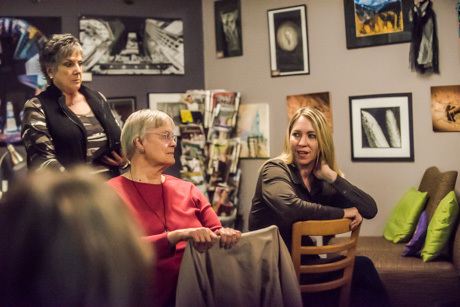 Bev Mancuso, background in the top photo, led the discussion. Diana Kastenbaum, owner of Pinnacle Manufacturing in Batavia. Kim Argenta, whose business, Art Ah La Carte, is in its 10th year. posted by Billie Owens in news, batavia, business, WNY Pediatric Endocrinology. Our doctors are both certified by the American Academy of Pediatrics in Pediatric Endocrinology and have more than 10 years experience treating patients. PCOS and other menstrual irregularities. The office will be open Monday – Friday from 9 a.m. to 4:30 p.m. Please call (585) 201-7112 to schedule an appointment and we’ll be happy to address your concerns! You can also check us out on our website at www.wnypedsendo.com. We look forward to serving the local community. 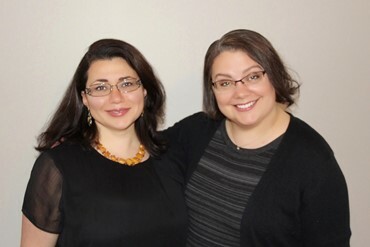 Nadezhda (Nadia) Danilovich, MD, (left in photo) graduated from Gomel State Medial Institute in Belarus and completed her residency and fellowship at Women and Children’s Hospital of Buffalo. She is a member of the American Board of Pediatrics and the American Board of Pediatric Endocrinology. Shannon Fournter, MD, (right in photo) graduated from the State University of New York at Buffalo School of Medicine and completed her residency at Children’s Hospital of Buffalo and her fellowship at Children’s Hospital of Philadelphia. She is a member of the American Board of Pediatrics and the American Board of Pediatric Endocrinology. posted by Howard B. Owens in Fishtales Hideaway, batavia, restaurants, news, business. In "Kitchen Confidential," Anthony Bourdain famously advised diners, "never order fish on a Monday." That works out well for Todd and Grace Sannin, who over the summer opened a new seafood restaurant in Batavia with a plan to make sure their fish is always fresh by buying it from the fish market in Buffalo on Wednesday and Thursday and serving it all by Saturday night. "That's advice we live by because when we do have our liquor license and we are open seven days a week, we are going to have a tighter menu," Todd said. "Our menu is going to be a shorter menu the days we're closed now, Sunday, Monday and Tuesday." With a little over two months in business under their belts, Todd and Grace like the way things are going and the response they've received from local diners so far. "We wanted to bring something that Batavia had a need for," Todd said. "There was a customer base here that nobody tapped into. There are the burger joints and the pizzerias and the Smoke House and the Italian restaurants. We thought Batavia had a need for something of this nature that would appeal to a certain audience and we found that audience." 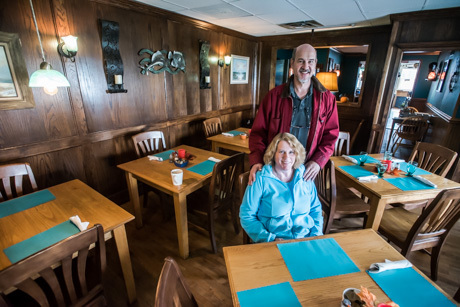 This is the fourth restaurant the couple has opened over the past 30 years. The previous ones were on the shores of Lake Ontario and while they also specialized in seafood, they were seasonal. Fishtales is their first attempt to run a seafood restaurant year around. The location is 107 Evans St., Batavia, the same location as The Little Ridge and Delavan's previously. Even without a liquor license yet and little marketing, people are finding the restaurant and the crowds are growing. "We've had a couple of really great Friday and Saturday nights recently," Grace said. "The best we’ve had. I would say the business is building right now and that was our goal." In recent weeks, flounder and snapper have been popular, along with tuna, cod, trout, and scallops (there's also steak and chicken on the menu). "Last Friday, it was not your typical Friday fish fry crowd," Todd said. "It was a younger crowd, a full house and they were going for more of the sauteed and the broiled dishes. Our crowd is changing and yet it's growing." Some local restaurateurs have shied away from seafood because customers demand freshness and they feared Batavia might not support seafood sufficiently to manage the product properly, but Todd said it's all about listening to your customers and paying attention to what they want. He felt confident he could make it work in Batavia. "We don’t cut corners here; we try to put a good product out and I think people are starting to notice that," Todd said. "At least that's the feedback we get." posted by Billie Owens in news, BID, Scarecrow Contest, batavia, business. The Batavia Business Improvement District hosted its first Scarecrow Contest for Downtown Batavia. As a creative way to add some more fall flavor to downtown decorating, the BID invited any business, group or organization to enter the contest. For $20 each business was provided basic supplies of straw, a post and zip ties along with their pole assignment. Each business could then get creative in creating their scarecrow. All voting for favorite scarecrow ended Friday, Oct. 19th. First-place winner receives $100 cash prize, second place $75 and third place $50. The BID would like to thank Home Depot for sponsoring the scarecrows and donating of posts, and to our City of Batavia Fire Department for assembling the posts. For more information on B.I.D. and Downtown events please visit our website at www.downtownbataviany.com. 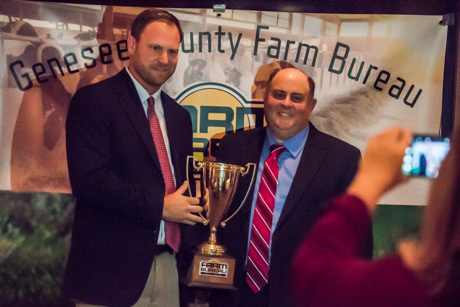 posted by Billie Owens in GC chamber of commerce 2018 awards, news, business. The Chamber’s Annual Awards Committee has announced the 2018 Annual Award Ceremony will be held on Saturday, March 2, at The Quality Inn & Suites, Park Road, Batavia (formerly The Clarion Hotel). This is the County’s premier event that honors businesses and individuals for their achievements in business, community service and volunteerism. Please note that a brief write-up will qualify your nominee for consideration. Business Nominees must be a Chamber Member (If unsure of your nominee, call the Chamber to verify). Nomination forms are available at the Chamber of Commerce office, 8276 Park Road, Batavia, and can also be downloaded from the Chamber website at www.geneseeny.com. Nominations MUST BE RECEIVED BY Dec. 28, to be eligible for consideration. If you would like more information, feel free to call Kelly J. Bermingham, director of Member Relations & Special Events at the Chamber office, 343-7440, ext. 1026.
posted by Billie Owens in education, news, GCC, business, Food Processing Technology A.A.S.. When a career needs a boost -- community colleges are the best place for a dedicated employee and a desirable company to meet and develop a plan of action that satisfies the interests of both. Such was case with Andy Willits who began working in an entry level position at LiDestri Food and Drink in Fairport when he was just 19 years old. After 13 years of service, he liked his job and his company, but he desired greater responsibility and a fresh challenge. With the support of the management team at LiDestri, Andy began researching career advancement paths and quickly discovered that in order to get where we wanted to be, he would need a college degree. "GCC was the only community college in Western New York to offer degrees in food processing. I found the two-year degree specifically focused on food manufacturing and it offered a flexible schedule, it was perfect," Willits said. In January 2018, after just two years at GCC, he earned a Food Processing Technology A.A.S. degree. 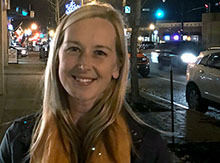 "Earning the degree gave me a lot of personal satisfaction; it was a challenge to manage a full-time job, school and making sure I had enough time for my family," Willits said. "Completing the program gave me a real sense of accomplishment." He balanced the demands of work, home and school by taking advantage of GCC's robust online learning opportunities. He was able to complete 50 percent of Food Processing Technology A.A.S. without having to step foot on campus! During his last semester at GCC, Willits was able to apply the experiences gained at his current job to meet the requirements of the program's semester-long internship placement through the use of GCC's Credit for Prior Learning opportunity. "Having (GCC's) satellite campuses really helped with flexibility and managing my life inside of school and my family," Willits said. He also encouraged other returning college students to "ask about credit for prior learning. There are a lot of ways to make GCC fit into your life really well. Pairing my degree with my years of job experience has really opened up what opportunities I'm able to pursue." GCC recently received a highly sought-after State University of New York (SUNY) needs grant and completed significant upgrades to student laboratories and equipment to provide the most up-to-date learning experiences. GCC's FPT program was designed not only to prepare students to enter the workforce immediately, but to position them perfectly for a seamless transfer into a four-year degree program at any number of institutions both within and outside of the SUNY system. GCC currently has transfer agreements in place with SUNY Cobleskill, Cornell University College of Agriculture & Life Sciences and many more. GCC's transfer pathways programs help you plan your coursework to maximize your time in college. Learn more about transfer pathways at https://www.genesee.edu/offices/transfer/. Attend GCC's Open House Monday, Nov. 12, between 8:30 a.m. - 12 p.m. to meet professors and instructors, explore the campus, get help with financial aid and see exactly why so many individuals choose GCC. Details on the Food Processing Technology program are available at https://www.genesee.edu/academics/programs/tech/food/. posted by Howard B. Owens in Pontillo's, batavia's original, news, batavia, business. 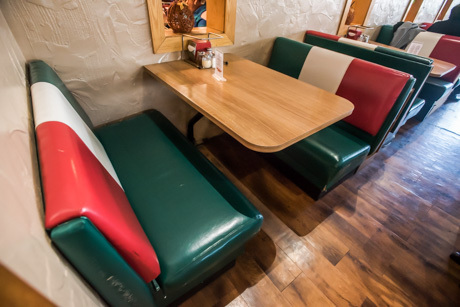 People are lining up to buy a bit of Pontillo's history -- the custom-made, red, white and green booth seats that were first installed in the restaurant 30 years ago. Batavia's Original owner Kathy Ferrara announced her plans to sell the booth seats and she immediately received several requests from would-be purchasers. She hasn't made any commitments yet. She's waiting for the replacement booths, which will be all black, to come in next week. "I didn’t realize it would be such a big deal to people," Ferrara said. A number of people expressed concern that she was selling Sam and Betty's booth, the one they always sat in, but it's not for sale and will stay in the restaurant, she said. She's only selling the ones in the larger dining room. She said she remembers when that dining room opened. She had just started working as a server for Pontillo's and the new booths were installed before even the rest of the trim of the room was completed. posted by Billie Owens in news, business, women in small business. posted by Howard B. Owens in Beth Kemp, BID, downtown, batavia, business, news, notify. Beth Kemp, executive director of the Batavia Improvement District, has decided the business she co-owns with her husband Brian, T-Shirts Etc. needs more of her time and attention so she's resigned her position. "It was an extremely hard decision for me because I love working as director of BID but T-Shirts Etc. continues to grow and I felt it was shortsighted of me to allow my own small business to struggle and continue my role here," Kemp said. "I was only able to maintain a few hours at T-Shirts Etc. while working for BID, which was definitely not enough to support what we need to do over there." Kemp has given notice to the board but she didn't share her final work day. The Batavian reached out to Jennifer Gray, president of the BID Board of Directors, for comment and information about finding a replacement for Kemp but we have not yet received a response. Kemp became director in November 2016. "This opportunity has been amazing and I am so thankful to have been able to work with so many amazing people in our community," Kemp said. "In the past two years we have put in a lot of work in. "We are in a great place with our finances, events, sponsorships, business relationships, community relationships, and mission. I look forward to still volunteering for events and community projects as the BID needs."